Malayalam movie star Fahadh Faasil was arrested by the Kerala police for allegedly evading road tax by forging documents. 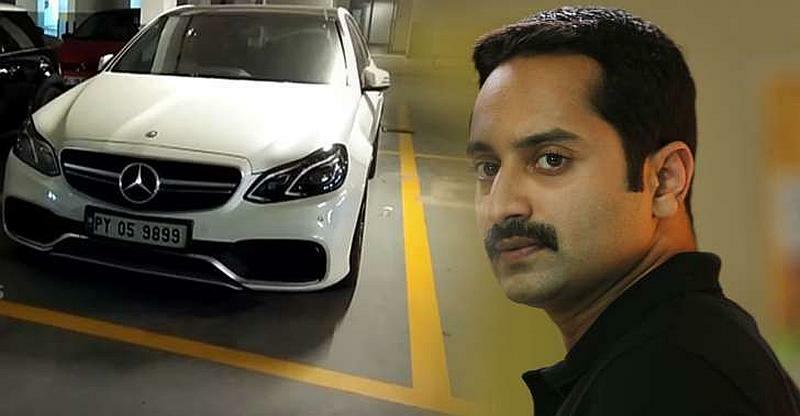 The actor is alleged to have gotten his Mercedes Benz E-Class E63 AMG high-performance luxury sedan registered in Pondicherry, thereby evading road tax payable to the Kerala RTO. The charge on which he was arrested was forgery. Mr. Faasil was later released on bail. Here’s how it played out! Kerala government ordered a probe into such high-end cars registered at Pondicherry, by using forged documents. The police department’s crime branch, which investigated these cases, found that the addresses that were used to register these high-end luxury cars in Pondicherry were often one-room houses, with its residents having no idea about the car’s being registered with their addresses. Notably, the actor had already moved Kerala high court for anticipatory bail, along with other prominent people accused of similar offences. BJP MP Suresh Gopi, who is also a noted film star in Kerala, also applied for anticipatory bail last week at the Kerala high court, and so did Amala Paul, a popular South Indian actress. Both Mr. Gopi and Ms. Paul moved anticipatory bail even as Kerala police prepared to arrest them on forgery charges pertaining to registration of high-end Audi Q7 SUV and Mercedes Benz S-Class luxury saloon respectively. These cars, like Mr. Faasil’s E-Class, were registered at Pondicherry allegedly through forged documents, but were being regularly used on Kerala roads without paying that state’s road tax. A lot of luxury car owners in South India get their cars registered at Pondicherry, with most of them allegedly using forged documents, often in connivance with car dealerships and local RTO touts. The road tax in Pondicherry is a flat 1.5 lakh rupees on luxury cars, whereas in Kerala, Tamilnadu, Andhra Pradesh and Telangana, it can go up to 20 % of the luxury car’s ex-showroom price, which in many cases comes to 20 lakh rupees or more. The only documentary requirements to register a car in Pondicherry are 1. Proof of ownership 2. Proof of residence in Pondicherry, for which a rental agreement will do. This is why so many luxury car owners forge rental agreements and get their high-end vehicles registered in Pondicherry by paying a much lower road tax. RTOs in Tamilnadu, Karnataka and Kerala are now cracking down on high-end cars plying with Pondicherry (PY) registration plates. Legally, a car owner can drive his out-of-state (car registered in a different state) car for 11 months, following which he has to pay the road tax of the new state where he is plying his vehicle. For example, if one registers a car in Pondicherry, he can use the car in Bangalore for 11 months, after which he needs to pay the road tax of Bangalore. If he fails to pay road tax of Bangalore (Karnataka) even after 11 months and is caught by RTO officials, his car will be seized, and released only after payment of and the road tax, along with a penalty. In case of Fahadh Faasil, Suresh Gopi, and Amala Paul, the police have registered cases not for tax evasion (which is hard to prove) and instead for forgery (as the crime branch probe has revealed forged documents). If convicted, forgery attracts jail time of up to 2 years, and a monetary fine under section 465 of the Indian Penal Code. If convicted, Mr. Gopi could lose his Rajya Sabha membership apart from going to jail, while Ms. Paul and Mr. Faasil could also be jailed.